In a world where it technological advances are being made every single day, there’s one type of technology that has been around for ages and remains just as popular as it did when it first came onto the scene more than 100 years ago: the ham radio. These devices can be used to communicate with people in the next town, across the country, around the globe, and even into space! Though technically they’re used for enjoyment, amateur radios – aka, ham radios – are also serve as a crucial tool across various industries. Below, you’ll find a detailed overview of these five ham radios. After you’ve read through the reviews and you’ve decided which one you’d like to invest in, click on the yellow link to find the best prices currently available on Amazon. To start our list of the best ham radios is the Kenwood Original TH-D74A. 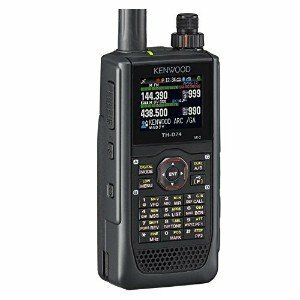 Kenwood is one of the most reputable manufacturers of communication, navigational, and other types of technology. Their products include police scanners, radio detectors, long range walkie talkies, and so much more. Their Original TH-D74A is one of the premier ham radios available. This device features everything you could want in a ham radio; plus, it’s extremely reliable and easy to use. 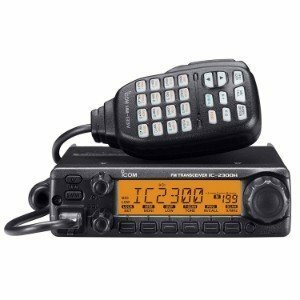 It’s compliant with digital/voice mode D-STAR digital amateur radio networks, and it offers wide-band and multi-mode reception, so you’ll have no trouble connecting and communicating. It also features packet communication, which enables it to share real-time GPS positional information and messages, so it doubles as an amateur radio and a handheld GPS. There are four TX power selections on this device, including 5/2/0.5/0.05 W, and it also offers IF filtering, which allows for SSB, CW, and AM reception. It’s also compliant with microSD, Micro USB, and Bluetooth standards, so you can truly customize it to meet your needs. It’s easy to read, too, thanks to the transflective color TFT display. Plus, it’s fully weatherproof, so there’s no need to worry about issues in moist environments. Most customers who have used this ham radio are very pleased with it. Many said that they loved the features and how easy it is to use. Final Verdict: Overall, we were very impressed with the Kenwood Original TH-D74A ham radio. We love that it exchanges real-time GPS information and messages, how clear the reception is, that it’s compatible with Bluetooth, microSD, and Micro USB, and how easy it is to use. Next up on our list of the best ham radios is the Yaesu FT-60R. 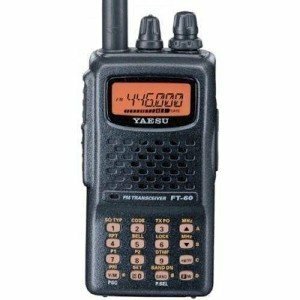 Yaesu is highly regarded for their line of premium quality radios, and the FT60R certainly lives up to the manufacturer’s reputation. This handheld amateur radio is constructed of durable materials, easy to use, and packed with features, making it a suitable option for novice and experienced ham radio users alike. This dual band VHF/UHF ham radio device is outfitted with an array of programming options, including more than 1,000 memory channels, ten memory banks, and nine DTMF auto dialer memories. It receives 108-520Mhz and 700-999.99mhz and transmits 122-148Mhz and 430-470Mhz. It can also be used as a weather radio, as it offers one-touch access to NOAA weather and the ability receive and scan severe NOAA severe weather alerts, you’ll be able to stay on top of any upcoming storms. Other key features include mono-band and memory-only operating modes, two programmable keys, which are located on the front panel, and an RF squelch that only passes signals that exceed the programmed level to ensure clarity. The large LCD display is easy to read, and it features Yaesu’s exclusive ARTS (Auto Range Transponder System), so you’ll know exactly when the device is no longer in your communication range. Lastly, it features a water resistant case that’s made of durable die cast materials, so it will stand up to wear and tear. According to the reviews that we read, customers are very happy with this ham radio. Many said that it’s the best low-cost amateur radio on the market. Final Verdict: If you’re looking for a high quality ham radio that won’t break the bank, the Yaesu FT-60R is an excellent choice. It offers basic and advanced features, is easy to use, and is durably constructed to ensure it will last a long time. If you’re just starting to explore communications with ham radios and you don’t want to spend a lot of money on your first device, or you’re looking for a backup device, the BaoFeng BF-F8HP is a great option. 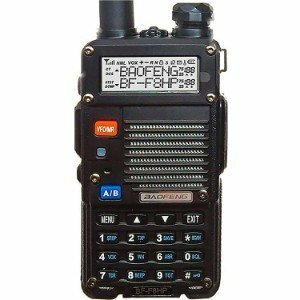 BaoFeng offers a variety of communication devices, including basic two-way radios, handheld two-way radios, waterproof two-way radios, and of course, ham radios. The BF-F8HP (UV-5R 3rd Gen) is the upgraded model of their UV-5R; it offers 8 watts of power as opposed to 4 watts, so it offers twice as much output power. It also has a new and improved hardened radio shell for increased durability, and the battery is 30 percent larger. While it’s an upgraded model, it was designed with novice users in mind, as it is incredibly easy to use and comes with a highly detailed user manual and it comes complete with exclusive customer and warranty support. Power settings on this handheld ham radio include high (8W) medium (4W), and low (1W). The frequency ranges between 65 and 108 MHz; however, it only offers commercial radio reception. It’s also equipped with a built-in flashlight and a built-in radio! It comes complete with a V-85 antenna, a power adaptor, an earpiece, a belt clip, a hand strap, and a battery charger, so you’ll have everything you need to start using and making the most of this device. Programming is simple and straightforward; especially when you follow the user manual. If you’re having any difficulties, the included concierge support will walk you through it. This device is highly recommended by users and has received outstanding reviews. Comes with all of the equipment needed, including an 85 antenna, charger, earpiece, belt clip – and more! Final Verdict: The simplicity of the design and the upgraded functionality make this an excellent ham radio for users of all experience levels; especially those who are just getting started with ham radio communication. If you’re on the market for a durable, easy to use ham radio to use in your vehicle, then the ICOM 2300H 05 144 MHz Amateur Radio is a great option. It has a compact profile and is easy to mount, so it can be secured to the dash of virtually any vehicle. It also offers high wattage, which means great capabilities, and it’s very easy to use. This ham radio feature a 207 alphanumeric display, which is highly visible, thanks to the LCD monitor (which can be set to amber or green, depending on your preference). It offers multiple scan functions, including full, bank, programmed, memory, skin, bank link, tone, and priority, which means that you can opt for whichever option works for your specific needs, making it extremely versatile. With weather alerts, you’ll be able to stay current with any impending storms that may be coming your way so you can make proper accommodations. Other key features include an automatic repeater and a repeater lockout, a timeout timer, voltage display, an S-meter squelch, a DTMF autodial – and so much more! You also have the option to select narrow and wide channels, and it’s very clear and easy to hear. All of this, plus it offers 65W of stable output. This ham radio really is one of the best on the market. Final Verdict: If you’re looking for a ham radio to use in your vehicle, we think you’ll really like the ICOM 2300H 05 144MHz Amateur Radio. It offers all of the functionality that you could possibly need, it’s easy to use, and it has a compact, space-saving design. Last but not least on our list of the best ham radios is another option from BaoFeng. Their UV-5R is the most affordable ham radio on our list, but just because it’s low priced doesn’t mean that it isn’t reliable; since it’s made by BaoFeng, you can be sure that it’s just as high quality and reliable as all of the other devices that this manufacturer offers. This ham radio has a maximum output of 8watts, so it offers plenty of power. The speaker output is an impressive 700mw, which means that you’ll have no trouble hearing in even the harshest conditions. 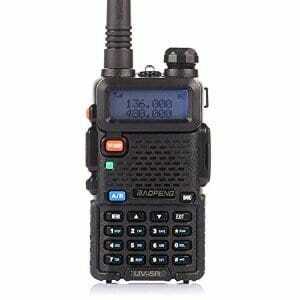 The frequency range is 136 to 174 VHF and 40 to 520 with UHF, which is standard for a portable ham radio. The 1500mAh battery offers plenty of power and it monitors between two different frequencies, offering priority to the first station that receives an incoming call. It’s also equipped with a built in FM radio, so you’ll be able to get the latest news reports or listen to your favorite tunes. The built in flashlight LED flashlight, so you’ll have a dependable light source when you need one. Other notable features include a keypad lock to prevent accidental changing, dual display, dual band, and dual lock. You also have the option to upgrade the antenna and expand the battery life by using batteries that offer extended power and are compatible with the device. Final Verdict: If you’re looking for an affordable way to stay in touch or you’re just exploring ham radio communication, the BaoFeng UV-5R should suit your needs. It offers all of the basic functions, plus a few add-ons; and, you have the option to expand its compatibility with a larger antenna and an extended battery. Amateur radios, also known as ham radios, have been around for quite some time; in fact, they date back to the late 19th, early 20th century. These devices are the most powerful form of wireless communication that laypeople have access to; they can be used to connect with people down the street, in the next town, several states away, across oceans, and even through the cosmos! Yes, people have used ham radios to communicate with astronauts up in space! Pretty impressive technology, right? If you’re new to the ham radio and you want to take advantage of this exciting technology, you’re going to want to use a reliable device to connect you with other amateur radios. Below, we’ll shed some light on the benefits of using this type of communication and key factors that you should take into consideration when selecting a ham radio. Meet people from around the globe – or even up in space! Ham radio really is the first social network, as it has been connecting people for more than 100 years. These are just some of the reasons why a ham radio is a great tool to have. Whether you just want to explore and have some fun or you want to stay connected so you can keep tabs on the latest news events, a ham radio is an excellent tool to invest in. In this review, we offer five options that will suit a variety of needs; each one is high quality and affordably priced.